Active since the late nineties, Julie’s Haircut is a five piece collective from northern Italy. Their debut album “Fever in the funk house” (Gammapop, 1999), a strange mixture of garage rock, noisy psychedelia and pop melodies was hailed at by the critics as one of the best debuts in Italian indie rock and was included in the top 50 Italian albums of the 90's by the magazine Rumore. The follow-up “Stars never looked so bright” (Gammapop, 2001) mixed these elements with a more soulful approach, mirroring the love for 60’s black music nurtured by the band. In 2003, after switching to Homesleep Records Julie’s Haircut released their third album “Adult situations”, the first to be internationally distributed. Here, melody and odd psychedelia mingle in a more personal way. By 2005 the music of Julie’s Haircut has moved towards more experimental grounds, focusing on improv and sound research, without losing touch with the groove and melody that characterized their music since day one. The result is their fourth album “After dark, my sweet” (Homesleep, 2006), featuring former Spacemen 3 Sonic Boom, acclaimed as one of the best alternative Italian albums of the year and included in the top 20 psychedelic Italian albums of all time by the magazine Il Mucchio. In 2006 they also functioned as “sound carriers” for some performances of former Can singer Damo Suzuki, thus entering the Damo Suzuki Network and consolidating a warm and ongoing relationship with the japanese/german artist. The collaboration with Sonic Boom also resulted in the release, in 2007, of the EP "N-Waves/U-Waves", including studio jams with the english musician. In 2009 the double album "Our Secret Ceremony" was released by A Silent Place. A new 10” single, featuring cover versions of Alejandro Jodorowsky’s The Tarot, from “The Holy Mountain” soundtrack and Nino Rota’s O Venezia Venaga Venusia, from the "Fellini’s Casanova” soundtrack, was released in june 2011. 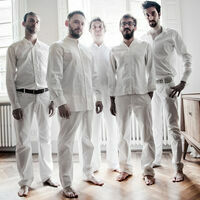 In june 2012 the ep "The Wildlife Variations" was released through Woodworm Music & Trovarobato. In 2012 the band has begun a collaboration with the american Fluxus composer Philip Corner, resulting in a live performance in Reggio Emilia, a recording of Corner's music under the direction of the composer and a sound installation featured in the exhibition "Women in Fluxus and other experimental tales" held at Palazzo Magnani in Reggio Emilia.